Tierra has a wide assortment of outdoor pants for all seasons and activities. The pants are known for their durability in combination with a soft inside and stretch, which gives high comfort and movability. Erik Blomberg, Head of Product Development at Tierra, tells you how to choose the right pants for the right activities. – We created Tierra’s Two-Face Stretch because we wanted a soft and stretchy material, yet with high durability. This makes the garments windproof and water resistant while they also “breath” extremely well. In addition they have a fluorocarbon free DWR. Our pants in Two-Face Stretch are as popular among women as among men, probably for the comfort they provide. It is a great investment to get this type of pants, we call them the pants of the mountain. These are the pants you tear, and they cover most of the needs when you are out. – During extreme weather conditions you change to shorts, shell pants or padded pants of course. The advantage of tearing your Two-Face Stretch pants is that they have a lower price than for example shell pants, and also higher comfort. It is not necessary to bike to and from work every day in shell pants if it’s not raining. You will get warm, moist, and the pants don’t have any stretch. "We call them the pants of the mountain"
How do I choose the right pants? Erik’s advice is to choose pants through three factors: season, intensity and climate. Think about in which seasons you want to use the pants, if it is for activities with high pulse or for calmer hikes, and in which climate. Our thinnest pants Pace Pant M/Pace Pant W and Pace Convertible Pants M/Pace Convertible Pants W are suitable for warmer climates and summer. But if you are going to hike in the Swedish mountains Lite Track Pant M/Lite Track Pant W or Lite Track Convertible Pant M/Lite Track Convertible Pant W are the better options since they have a waterproof reinforcement at leg ends. If you are going to work on your knees often, our most durable pants Ace Pant M/Ace Pant W are the best choice since they have knee reinforcements. 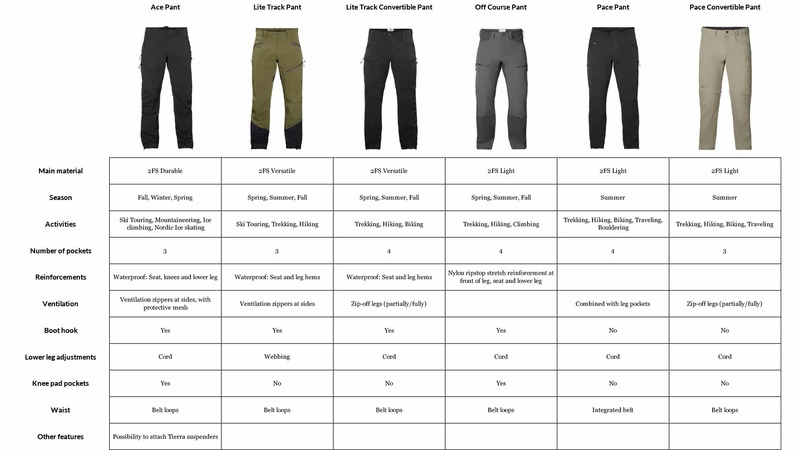 We at Tierra have developed outdoor pants in Two-Face Stretch for several years. Tierra’s test team is always a big part of the product development process. One example is when we started to develop our thin summer pant Pace. – When we finally dared to make a lighter pant we found out that our test team really appreciated the ease and agility. They loved the pants and used them for more activities than we had thought, such as on glaciers and for climbs. But they didn’t think that the pants were windproof enough, as we never thought about using the pants during fall and spring or on glaciers. With their feedback we created Off-Course Pant M/Off-Course Pant W.
Off Course has the same ease and agility as Pace but has wind protection on exposed areas such as the bum and front thigh. The other areas still have great ventilation.